Simply give us your details below or call with these and we will send you a beautiful handpainted plate. Please allow 10-14 working days for this process. 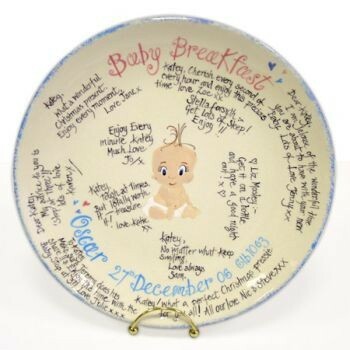 You can then write your special messages onto the plate, using the pen provided or simply give it as it is. Choose from a traditional round plate (28cm diameter) or a more contemporary square plate (27cm x 27cm) as shown in the picture. Please enter your personalisation details into the text box below. Each plate arrives in a plate box together with a special pen to write with, instructions and a plate stand.